An open question is one where the response can be general and conversational while a closed question is usual asking for a precise answer. So..
"Do you like chocolate?" would be a closed question as the answer is likely to be either "yes" or "no"
"What snacks do you like?" would be an open question as the answer could be very wide ranging. "80 out of our survey of a 100 people say they like chocolate" This information could then be expressed as a statistic or a graph or table. "Most people in our survey said they liked a range of snacks both sweet and savoury although many claimed that they didn't snack at all" Data of this sort may be difficult to convert to a numerical or statistical value and may have to be written up in a narrative form. "University is intended to provide you with the skills and knowledge necessary to succeed socially and professionally in a complex multi-cultural world. Taking into account the various factors that influenced your decision to study at HE level, including economic, political and gender issues, are you happy with your student experience?" Now, on the face of it this looks like a smart, informed and complex question that ought to provide the researcher with lots of valuable data. However, if you look again you will see that the structure of the question could be taken as "closed" and might only provide you with a "yes" or "no" answer. A little thought can make all the difference to a question and the data it provides you with. It is important to know when numbers are more informative than words and the other way round. Quantitative data is numerical information that lends itself easily to statistical analysis and tabulation in graphs and tables. Quantitative data often takes the form of a precise measurement. Eg: 20% of our 200 person sample are under 5 foot 10 inches tall. 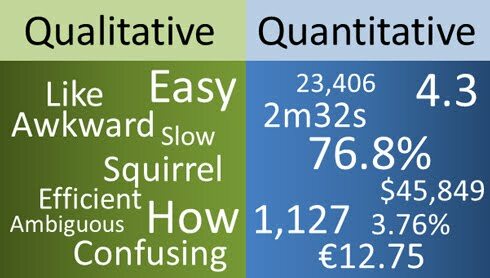 Qualitative data is more descriptive and general and tends to be presented in text rather than numerical form. This sort of data is often gathered by interview rather than precise experimentation and measurement. Eg: The interviewee expressed some embarrassment about their height and made a number of references to their desire to be a bit taller. Primary research is where you go out and gather the information yourself, first hand. You might use questionnaires, surveys, interviews or various experiments from which you will gather and interpret data. Secondary research is where you build an argument or discussion based upon the work of others who have had more time, resources and opportunity to conduct research which they have made available to the academic community. Obviously this material would need to be referenced so as to give credit to the original researcher. It is often the case that a piece of research comes across as poor not because it doesn't do enough but because it promises too much. Stating at the outset of an essay, report or dissertation that you recognize the limitations of your work and spelling these out clearly will make you look smart and thoughtful. A mature piece of work is one that knows where it's weaknesses are and exactly what it is capable of given time and other resource limits. If you open almost any academic text book the first chapter is more often than not a statement about not only what the author intends to do to tackle an issue but also what they don't intend to do. Making rash general claims such as "In this essay we will provide an in depth study of all the factors influencing chocolate consumption" when you have a 2000 word limit and a 2 month deadline is asking for trouble. As part of the introduction to any piece of work show that you recognize that you probably wont be able to cover all the relevant factors but that you have thoughtfully selected some that you consider significant. Let the reader know that you have limited your research to a particular time and place as a consideration of every country that consumes chocolate is likely to be beyond the scope of the present work - even a 100,000 word PhD thesis would struggle to cover chocolate consumption at all times and in all places! Take care not to give the impression that you genuinely believe that having interviewed 10 people and referred to 12 texts you have mastered the topic and exhaustively answered the question, solved the problem and provided the conclusive argument. Present your argument, back it up with as much data as you can but make sure that you hold up your hands and admit to the limits of the work. "In a recent piece of primary research 100% of people surveyed claimed that they liked chocolate"
Now, this may sound jolly impressive until it is revealed that you only interviewed your 5 year old baby sister. Making sure you have a realistic sample size for a survey is vitally important if you intend your data to be considered authoritative. However, in most cases an essay, even a dissertation, produced at undergraduate level is unlikely to provide you with enough time or resources to conduct wide-ranging primary research. For this reason it is important to limit the parameters of the research so that you aren't trying to cover too much. "While we recognize the limitations of our sample size and understand that the data gathered is by no means authoritative the method used to gather this data is sound and if used with a much larger sample would generate significant results." or in other words: "What I've done may not be conclusive but the way I did it was sound"
Books are what the internet used to be called back in the day. While it is very useful to be able to Google information and access online sources it is well worth visiting the library and browse hard-copy texts. There are still a tremendous number of books that are not available online. Avoid the temptation to simply research short potted online sources of information and brief articles. Make the effort to engage with more substantial texts on your research topics and learn how to extract the most useful information. Remember, just because a text is 500 pages long this does not mean that you have to read every page before you can extract anything useful from it. Check the blurb on the back cover and the introduction to get a broad sense of the subject matter. Read through the contents page to quickly see the topics being covered. Make use of the index of key words at the back of the book to help you track down the relevant sections and pages. A little knowledge can sometimes go a long way. Understanding what an academic term means, or which research method is likely to be most useful to you can make a huge difference to your work. Simply being familiar with the rules of the academic game can make your work look smart and informed.